Postal Annex of Chino Hills is your local shipping company, providing shipping supplies, boxes and all of your needs for national or international services. Save time and feel assured that your packages are on their way. You can track your UPS or Fed Ex packages online by clicking here. We live and work in Chino Hills and want to earn your patronage by being the best local shipping company you can find. UPS is a 95 year-old company whose history spans the bicycle to the Internet. Today they are the world's largest express and package carrier. UPS continues to develop the frontiers of logistics, supply chain management, and e-commerce... combining the flows of goods, information, and funds. We're proud to be an official drop-off point for UPS services. FedEx is one of the world's great success stories, the start-up that revolutionized the delivery of packages and information. In the past 30 years, they've grown up and grown into a diverse family of companies. If you need help with Fed Ex, we're the place to come. Mail boxes are billed quarterly, 6 months, or annually. If you pay for 6 months in advance at once, we'll give you 1 month free (7 months). If you pay for 12 months in advance at once, we'll give you 3 months free (15 months). There is a $5.00 set-up fee and a $10.00 refundable key deposit. We accept all mail and packages from any carrier. We offer free mail forwarding services, but postage is extra. Postal Annex' Chino Hills mail box rental also gives you a more professional business address. Many of our customers who run businesses out of their home don't like the idea of using their home address on all of their business correspondence. A mail box rental gives you the peace of mind that your home address will stay private and creates a more professional business address for you home business at the same time. 15942 Los Serranos C.C. Drive, Unit D-??? Note: Please be sure to include your box unit number whenever you give out your address. We often must return mail as undeliverable because box / unit numbers are not specified. 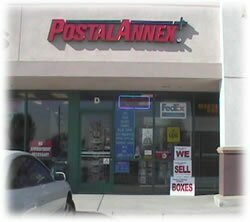 Remember Postal Annex of Chino Hills when you think of shipping supplies, boxes, international shipping, etc. We want to company that comes to mind when you need these services. Please come in and talk to us, especially now that the holidays are coming around.